As part of the VSAN cluster creation step, each ESXi host has a VSAN storage provider registered with vCenter. This uses the vSphere APIs for Storage Awareness (VASA) to surface up the VSAN capabilities to the vCenter Server. The capabilities can then be used to create VM storage policies for the VMs deployed on the VSAN datastore. If you are familiar with VASA and have used it with traditional storage environments, you’ll find this functionality familiar; however, with traditional storage environments that leverage VASA, some configuration work needs to be done to add the storage provider for that particular storage. In the context of VSAN, a vSphere administrator does not need to worry about registering these; these are automatically registered when a VSAN cluster is created. VASA allows storage vendors to publish the capabilities of their storage to vCenter Server, which in turn can display these capabilities in the vSphere Web Client. VASA may also provide information about storage health status, configuration info, capacity and thin provisioning info, and so on. VASA enables VMware to have an end-to-end story regarding storage. 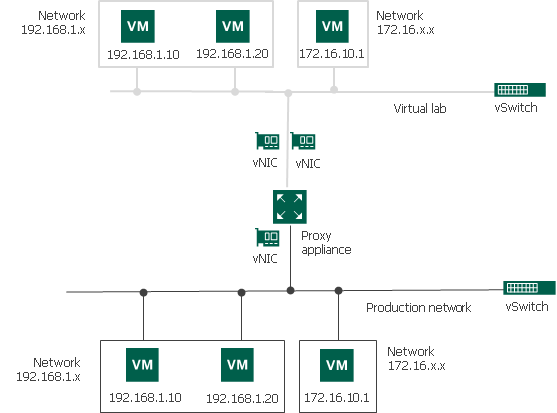 Traditionally, this enabled storage arrays to inform the VASA storage provider of capabilities, and then the storage provider informed vCenter Server, so now users can see storage array capabilities from vSphere Web Client. Through VM storage policies, these storage capabilities are used in the vSphere Web Client to assist administrators in choosing the right storage in terms of space, performance, and service-level agreement (SLA) requirements. This was true for both traditional storage arrays, and now it is true for VSAN also. Prior to the release of virtual volumes (VVols), there was a notable difference in workflow when using VASA and VM storage policies when comparing traditional storage to VSAN. With traditional storage, VASA historically surfaced information about the datastore capabilities, and a vSphere administrator had to choose the appropriate storage on which to place the VM. With VSAN, and now VVols, you define the capabilities you want to have for your VM storage in a VM storage policy. This policy information is then pushed down to the storage layer, basically informing it that these are the requirements you have for storage. VASA will then tell you whether the underlying storage (e.g., VSAN) can meet these requirements, effectively communicating compliance information on a per-storage object basis. The major difference is that this functionality is now working in a bidirectional mode. Previously, VASA would just surface up capabilities. Now it not only surfaces up capabilities but also verifies whether a VM’s storage requirements are being met based on the contents of the policy. Figure 4.6 illustrates an example of what the storage provider looks like. When a VSAN cluster is created, the VASA storage provider from every ESXi host in the cluster is registered to the vCenter Server. In a four-node VSAN cluster, the VASA VSAN storage provider configuration would look similar to this. You can always check the status of the storage providers by navigating in the Web Client to the vCenter Server inventory item, selecting the Manage tab and then the Storage Providers view. One VSAN provider should always be online. The other storage providers should be in standby mode. This is all done automatically by VSAN. There is typically no management of the VASA providers required by administrators. In VSAN clusters that have more than eight ESXi hosts, and thus more than eight VASA storage providers, the list of storage providers is shortened to eight in the user interface (UI) for display purposes. The number of standby storage providers is still displayed correctly; you simply won’t be able to interrogate them. You might ask why every ESXi host registers this storage provider. The reason for this is high availability. Should one ESXi host fail, another ESXi host in the cluster can take over the presentation of these VSAN capabilities. If you examine the storage providers shown in Figure 4.6, you will see that only one of the VSAN providers is online. The other storage providers from the other two ESXi hosts in this three-node cluster are in a standby state. Should the storage provider that is currently active go offline or fail for whatever reason (most likely because of a host failure), one of the standby providers will be promoted to active. There is very little work that a vSphere administrator needs to do with storage providers to create a VSAN cluster. This is simply for your own reference. However, if you do run into a situation where the VSAN capabilities are not surfacing up in the VM storage policies section, it is worth visiting this part of the configuration and verifying that at least one of the storage providers is active. If you have no active storage providers, you will not discover any VSAN capabilities when trying to build a VM storage policy. At this point, as a troubleshooting step, you could consider doing a refresh of the storage providers by clicking on the refresh icon (orange circular arrows) in the storage provider screen. What should be noted is that the VASA storage providers do not play any role in the data path for VSAN. If storage providers fail, this has no impact on VMs running on the VSAN datastore. The impact of not having a storage provider is lack of visibility into the underlying capabilities, so you will not be able to create new storage policies. However, already running VMs and policies are unaffected. Being able to change a VM storage policy on-the-fly is quite a unique aspect of VSAN. We will use an example to explain the concept of how you can change a VM storage policy on-the-fly and how it changes the layout of a VM without impacting the application or the guest operating system running in the VM. Consider the following scenario, briefly mentioned earlier in the context of stripe width. A vSphere administrator has deployed a VM on a hybrid VSAN configuration with the default VM storage policy, which is that the VM storage objects should have no disk striping and should tolerate one failure. The layout of the VM disk file would look something like Figure 4.7. The VM and its associated applications initially appeared to perform satisfactorily with a 100% cache hit rate; however, over time, an increasing number of VMs were added to the VSAN cluster. The vSphere administrator starts to notice that the VM deployed on VSAN is getting a 90% read cache hit rate. This implies that 10% of reads need to be serviced from magnetic disk/capacity tier. At peak time, this VM is doing 2,000 read operations per second. Therefore, there are 200 reads that need to be serviced from magnetic disk (the 10% of reads that are cache misses). The specifications on the magnetic disks imply that each disk can do 150 IOPS, meaning that a single disk cannot service these additional 200 IOPS. 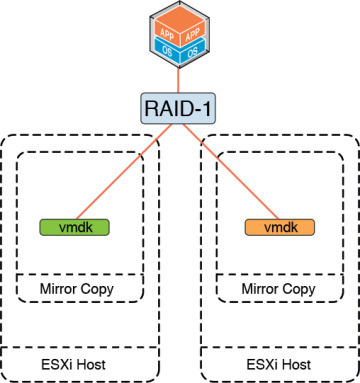 To meet the I/O requirements of the VM, the vSphere administrator correctly decides to create a RAID-0 stripe across two disks. On VSAN, the vSphere administrator has two options to address this. The first option is to simply modify the VM storage policy currently associated with the VM and add a stripe width requirement to the policy; however, this would change the storage layout of all the other VMs using this same policy. Another approach is to create a brand-new policy that is identical to the previous policy but has an additional capability for stripe width. This new policy can then be attached to the VM (and VMDKs) suffering from cache misses. Once the new policy is associated with the VM, the administrator can synchronize the new/updated policy with the VM. This can be done immediately, or can be deferred to a maintenance window if necessary. If it is deferred, the VM is shown as noncompliant with its new policy. When the policy change is implemented, VSAN takes care of changing the underlying VM storage layout required to meet the new policy, while the VM is still running without the loss of any failure protection. It does this by mirroring the new storage objects with the additional components (in this case additional RAID-0 stripe width) to the original storage objects. As seen, the workflow to change the VM storage policy can be done in two ways; either the original current VM storage policy can be edited to include the new capability of a stripe width = 2 or a new VM storage policy can be created that contains the failures to tolerate = 1 and stripe width = 2. The latter is probably more desirable because you may have other VMs using the original policy, and editing that policy will affect all VMs using it. When the new policy is created, this can be associated with the VM and the storage objects in a number of places in the vSphere Web Client. In fact, policies can be changed at the granularity of individual VM storage objects (e.g., VMDK) if necessary. After making the change, the new components reflecting the new configuration (e.g., a RAID-0 stripe) will enter a state of reconfiguring. This will temporarily build out additional replicas or components, in addition to keeping the original replicas/components, so additional space will be needed on the VSAN datastore to accommodate this on-the-fly change. When the new replicas or components are ready and the configuration is completed, the original replicas/components are discarded. Note that not all policy changes require the creation of new replicas or components. For example, adding an IOPS limit, or reducing the number of failures to tolerate, or reducing space reservation does not require this. However, in many cases, policy changes will trigger the creation of new replicas or components. 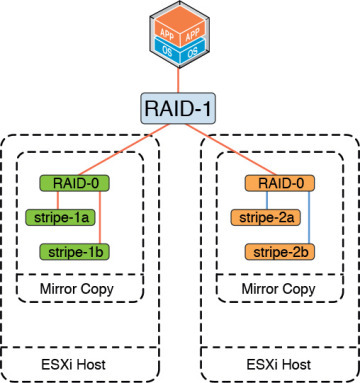 Your VM storage objects may now reflect the changes in the Web Client, for example, a RAID-0 stripe as well as a RAID-1 replica configuration, as shown in Figure 4.8. The migration of VMs from the original datastore. The decommissioning of the said LUN/volume. The creation of a new LUN with the new storage requirements (different RAID level). Possibly the reformatting of the LUN with VMFS in the case of block storage. Finally, you have to migrate your VMs back to the new datastore. In the case of VSAN, after the new storage replicas or components have been created and synchronized, the older storage replicas and/or components will be automatically removed. Note that VSAN is capable of striping across disks, disk groups, and hosts when required, as depicted in Figure 4.8, where stripes S1a and S1b are located on the same host but stripes S2a and S2b are located on different hosts. It should also be noted that VSAN can create the new replicas or components without the need to move any data between hosts; in many cases the new components can be instantiated on the same storage on the same host. We have not shown that there are, of course, additional witness components that could be created with such a change to the configuration. For a VM to continue to access all its components, a full replica copy of the data must be available and more than 50% of the components (votes) of that object must also be available in the cluster. Therefore, changes to the VM storage policy could result in additional witness components being created, or indeed, in the case of introducing a policy with less requirements, there could be fewer witnesses. You can actually see the configuration changes taking place in the vSphere UI during this process. Select the VM that is being changed, click its manage tab, and then choose the VM storage policies view, as shown in Figure 4.9. Although this view does not show all the VM storage objects, it does display the VM home namespace, and the VMDKs are visible. In VSAN 6.0, there is also a way to examine all resyncing components. Select the VSAN cluster object in the vCenter inventory, then select monitor, Virtual SAN, and finally “resyncing components” in the menu. This will display all components that are currently resyncing/rebuilding. Figure 4.10 shows the resyncing dashboard view, albeit without any resyncing activity taking place. Although the vSphere Web Client displays only the VM home namespace and the VMDKs (hard disks) in the VM > monitor > policies > physical disk placement, snapshot deltas and VM swap can be viewed in the cluster > monitor > Virtual SAN > virtual disks view. We will also show ways of looking at detailed views of all the storage objects, namely delta and VM swap, in Chapter 10, “Troubleshooting, Monitoring, and Performance,” when we look at various monitoring tools available to VSAN. VM storage policies work in an identical fashion to storage profiles introduced in vSphere 5.0, insofar as you simply build a policy containing your VM provisioning requirements. There is a major difference in how storage policies work when compared to the original storage profiles feature. With storage profiles, you simply used the requirements in the policy to select an appropriate datastore when provisioning the VM. The storage policies not only select the appropriate datastore, but also inform the underlying storage layer that there are also certain availability and performance requirements associated with this VM. 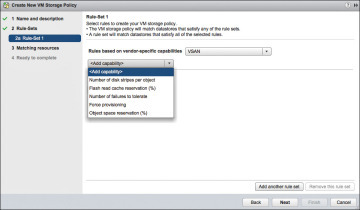 So while the VSAN datastore may be the destination datastore when the VM is provisioned with a VM storage policy, settings within the policy will stipulate additional requirements. For example, it may state that this VM has a requirement for a number of replica copies of the VM files for availability, a stripe width and read cache requirement for high performance, and a thin provisioning requirement. 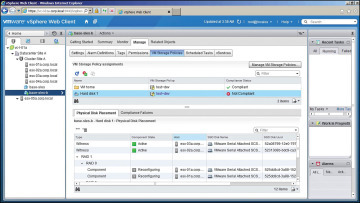 VM storage policies are held inside VSAN, as well as being stored in the vCenter inventory database. Every object stores its policy inside its own metadata. This means that vCenter is not required for VM storage policy enforcement. So if for some reason the vCenter Server is unavailable, policies can continue to be enforced. 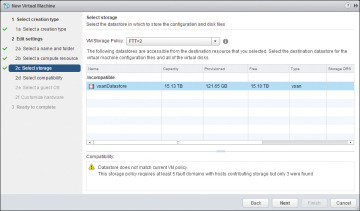 In the initial release of VSAN, VM storage policies could be enabled or disabled via the UI. This option is not available in later releases. However, VM storage policies are automatically enabled on a cluster when VSAN is enabled on the cluster. Although VM storage policies are normally only available with certain vSphere editions, a VSAN license will also provide this feature. 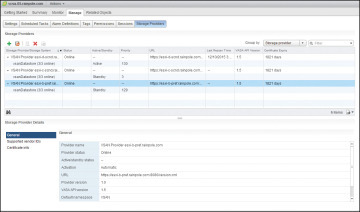 vSphere administrators have the ability to create multiple policies. 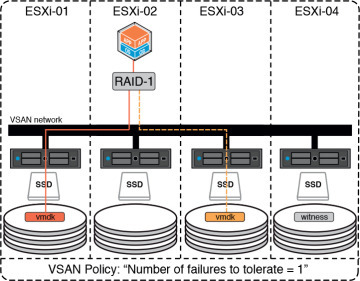 As already mentioned, a number of VSAN capabilities are surfaced up by VASA related to availability and performance, and it is at this point that the administrator must decide what the requirements are for the applications running inside of the VMs from a performance and availability perspective. For example, how many component failures (hosts, network, and disk drives) does the administrator require this VM to tolerate and continue to function? Also, is the application running in this VM demanding from an IOPS perspective? If so, an adequate read cache should be provided as a possible requirement so that the performance requirement is met. Other considerations include whether the VM should be thinly provisioned or thickly provisioned, if RAID-5 or RAID-6 configurations are desired to save storage space, if checksum should be disabled, or if an IOPS limit is required for a particular VM to avoid a “noisy neighbor” situation. Another point to note is that since vSphere 5.5, policies also support the use of tags for provisioning. Therefore, instead of using VSAN datastore capabilities for the creation of requirements within a VM storage policy, tag-based policies may also be created. The use of tag-based policies is outside the scope of this book, but further information may be found in the generic vSphere storage documentation. The assignment of a VM storage policy is done during the VM provisioning. At the point where the vSphere administrator must select a destination datastore, the appropriate policy is selected from the drop-down menu of the available VM storage policies. The datastores are then separated into compatible and incompatible datastores, allowing the vSphere administrator to make the appropriate and correct choice for VM placement. This matching of datastores does not necessarily mean that the datastore will meet the requirements in the VM storage policy. What it means is that the datastore understands the set of requirements placed in the policy. It may still fail to provision this VM if there are not enough resources available to meet the requirements placed in the policy. However, if a policy cannot be met, the compatibility section in the lower part of the screen displays a warning that states why a policy may not be met. This three-node cluster example shows a policy that contains a number of failures to tolerate = 2. A three-node cluster cannot meet this policy, but when the policy was originally created, the VSAN datastore shows up as a matching resource as it understood the contents of the policy. However, on trying to use this policy when deploying a VM, the VSAN datastore shows up as noncompliant, as Figure 4.11 demonstrates. This is an important point to keep in mind: Just because VSAN tells you it is compatible with a particular policy when that policy is originally created, this in no way implies that it can deploy a VM that uses the policy. You may have used VM storage profiles in the past. VM storage policies differ significantly. Although we continue to use VASA, the vSphere APIs for Storage Awareness, VM storage policies have allowed us to switch the storage characteristics away from datastores and to the VMs. VMs, or more specifically the applications running in VMs, can now specify their own requirements using a policy that contains underlying storage capabilities around performance, reliability, and availability. 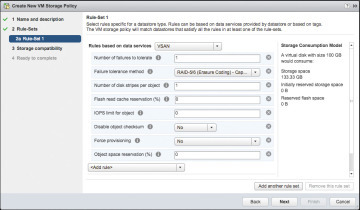 No matching vSAN (formerly known as Virtual SAN) datastores are listed in the matching resources page of the Storage Based Policy creation wizard. You are unable to create the storage based policy. This issue occurs due to inconsistent data between the Storage Management Service (SMS) and the Storage Based Policy Manager (SPBM). This is a known issue affecting VMware vSAN 5.5.x. In the vSphere Web Client navigate to vCenter Server > Manage > Storage Providers. Synchronize all vSAN providers by clicking on the red circular arrows. Rescan the storage providers for new storage systems and capabilities by clicking on the icon to the immediate right of the circular red arrows. Create your new virtual machine storage based policy and select vSAN as the matching datastore. For more information on Storage Providers and policy management, see Virtual SAN and Storage Policy-Based Management section in the VMware vSphere 5.5 Storage Guide. To be alerted when this document is updated, click the Subscribe to Article link in the Actions box. I was upgrading my VMware View environment recently from 5.0 to 5.1 and wrote about some initial problems in my article Trouble Recomposing View 5.x Desktops After Upgrade to vSphere 5.0 U2. After I had resolved those initial problems I needed to load my internal Root CA certificate onto all my company’s iPhone’s and iPad’s. This is because one of the big changes or improvements in View 5.1 is with security and you now need trusted certificates in order to connect to any of the desktops. Fortunately there is no need to purchase expensive public certificates if you have an internal corporate PKI / CA’s already configured, unless you want to. This article will show you how you can easily get your iPhones or iPad’s to trust your corporate CA certificates for use with VMware View. I’ve included images here to explain the process as I think it’s easier to follow. I used one of my iPhones to keep the images reasonably small. To be honest you’re much more likely to be doing this on an iPad. But iPhones are perfectly usable in my opinion provided you have the iPhone to VGA adapters and a Bluetooth Keyboard. There is no way to set your device to trust your CA certificate from this screen. In order for you to get your iPhone or iPad to trust the certificate you will need to follow the process below. You’ll notice the attachment in the image above shows a certificate type icon. At this point before continuing to the next step you should click on More Details. You should verify that it is indeed the certificate that you were expecting, it’s form your corporate CA, and that it is valid and should be trusted. Once you are satisfied this is indeed a legitimate certificate that you should trust you continue. Because your corporate CA is not a trusted public CA it is not automatically in the trusted list for your devices. This is the reason this warning is being displayed. Provided you are happy with the checks you’ve done in the previous step, after reading this warning you can continue to the next step. At this point you need to enter your passcode so that the certificate can be loaded into your devices trust store and be trusted. Once you have entered your passcode successfully you will automatically be at the next step. Now when you connect using the VMware View Client your Connection Servers certificates, which were signed by your corporate CA, will be trusted and your connections will be successful. If you have more than one CA that needs to be trusted you need to complete these steps for each of the certificates. You can now Tap Done and go back to the VMware View Client and test the connections. You can see by the tick on the padlock and the text https being displayed in green that the certificate and connection are trusted. If the connections weren’t trusted you wouldn’t have been able to connect. Enter your username and password and then tap done or go. 7. You will receive the list of entitled desktops similar to the image below and you can no proceed to use your desktops as per normal. This process is complete! If for some reason you find out that a certificate has become invalid or has been revoked you will need to remove it from the trust store on your iDevice. To do this is very simple. You can see the profile listed and the name of the CA in this example. 5. Tap Remove. You will see the passcode dialog box displayed as per the image below. 6. Enter your passcode. You will be returned to the settings screen and you’ll notice as per the image below that the profile has now gone. You have now completely removed the certificate from your devices trust store. When the new certificates are issued you can go back and follow the process to install them again. As you would expect Apple has made it fairly painless to get this all working. However when it comes to security and trusting certificates great care needs to be taken. You must verify that the certificates that are being sent to you for use are genuine and can be trusted. If for some reason the certificates expire, are revoked or for some other reason invalidated then you need to follow the process to remove the certificates from the trust store and then install the new ones. I hope this has been helpful and that you get hours of productivity out of your VMware View 5.1 vDesktops from your favourite iDevices.